After yesterday’s post on picking and ray-to-convex-polygon intersections, we were able to move our hero around our plane. Now, our hero can walk along an arbitrary path (a collection of points) at an arbitrary speed! Pathfinding: Notice line stemming from our hero. Navigational mesh: Triangulation drawn in cyan, graph links drawn in red. Navmesh: Spanning Entire Dungeon vs Per-cell Connected via Waypoints. As you can see in the above picture, there’s a square-shaped hole in the middle of the navmesh. Solid barriers in our dungeon (treasure chests, Trundle-like pillars, etc), will add holes to the navmesh! For now, I’ll be fully retriangulating the scene (or cell) on every obstacle modification – there’s definitely a ton of space for optimization here, but I’m hoping performance won’t be an issue due to my low polygon count and infrequent duration of hole modification. This approach will, in fact, make a few other operations a bit kludgy – for example, I’ll have to add special cases for pathfinding to obstacles. If the player were to pathfind to a treasure chest, I’d have to include the treasure chest’s navmesh hole in the pathfinder’s graph search. Of course, full retriangulation will only meet my minimum demands. Through constrained Delaunay triangulations, I’ll potentially be able to regenerate navigational meshes after holes are removed or added, only affecting a portion of my graph as opposed to regenerating the entire graph. If we partition the navmesh by cell, then we’ll have to deal with routing between cells. Fortunately, this doesn’t seem too difficult with waypointing – picture four entrances to each cell, placed in the middle of each side. We can treat these entrances as nodes on a graph, and we can easily compute the distance between nodes in a cell via our navmesh. With weights for each edge, we can perform A* to get an approximate path. Adventures in Shade 03: Cameras and Picking! 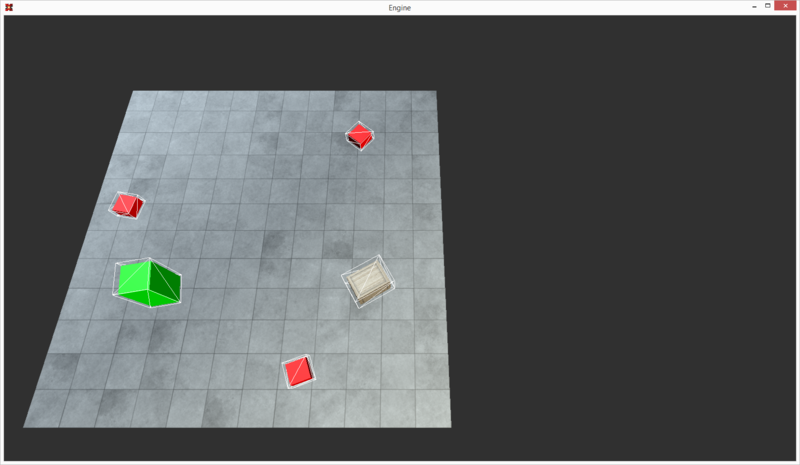 Today I got ray-plane intersection, bounding-box-based picking, and pan-able cameras working! Dungeons in Shade consist of many convex polygons linked together. For example: A room might consist of a square (or a hex!) and a corridor between rooms might consist of a longer rectangle. I implemented the logic to project a ray onto one of those convex polygons, allowing me to click within the polygon to move our hero to a position in the dungeon cell. Thank you high school linear algebra! Next off, I implemented bounding-box-based picking. 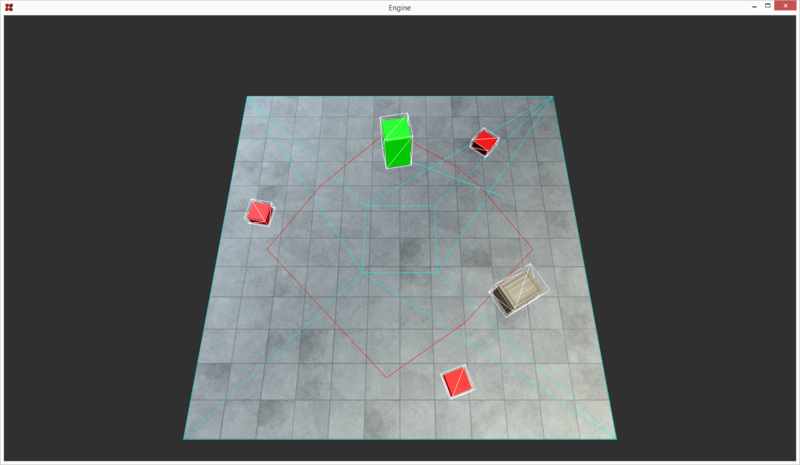 Meshes have model-space bounding boxes. Not sure if I'll add bounding spheres into the mix - I'll probably do that whenever I composites bounding volumes. With the same rays from earlier, I can naively test every object in the scene for intersection - I haven't implemented any optimizations (ie: spatial partitioning) yet. Finally, I reimplemented the camera (previously static view and projection matrices) - cameras are now entities like objects in the scene! Cameras have a Camera Component which exposes View and Projection matrices. The Position-Oriented Camera Component implementation even sources from the Position and Orientation components, so in code, moving a camera looks like moving any other entity. Moved Hero, Panned Camera, and Positive Bounding Boxes! Picking uses positive hitboxes (seen by the enlarged bounding boxes) following the internet's reasoning. To do this, I simply expanded the hitbox of a pickable object's mesh by 10%-20%. Camera panning took forever to implement, mostly because I spent 2am-4am trying to figure out why my camera was a bit off... turns out I'd written Math.Atan(10/4) instead of Math.Atan(10.0f/4.0f)... doh! I'm still undecided on Shade's camera system - Mabinogi's fixed-on-player camera felt extremely limiting, yet it did allow for intuitive free rotation. Such a system also frees the spacebar for jumping, which you can't do (as a movement command) in League of Legends. I might end up with a smart/dynamic camera system (ie: pan weighted towards you and the enemies you're targeting) or a more "creative" configuration (ie: mouse buttons 4/5 to center) - only time will tell! Adventures in Shade 02: Simple Renderings! I spent today working on the graphical side of Shade. As you can tell, everything's fairly boxy - in fact, everything's just a transformed (as in: scaled, rotated, or translated) unit cube! Textures are pulled off the internet (random googles for free textures) or of solid colors. You can't actually move around - I haven't implemented (or pulled in) a navmesh library or implemented any ghetto-physics. Hell, I haven't even decided if physics will care about the third dimension! There's definitely a ton of work to do here - I don't even have ray-box intersection at the moment! A Cell in a Shade Dungeon! I've been spiking a ton of code followed by blogging about it after a few days. This is great as it chronicles what I've been doing, but not so great as it doesn't let me address any problems which I face and solve. Not sure if I'll force myself to blog more often or if I'll keep posting whenever I hit tiny (visual) milestones. Oh, and when I say spiking, I mean that I've hacked together libdpo and libimdg as well as a on of other miscellaneous stuff you can see on shade's repository (view repo at commit dbc21bda). It’s been a wild year! This summer I interned with Riot Games as a Platform Engineer with Player Behavior. Before that, I withdrew from school in order to work full-time as a Software Engineer at Azubu. You can’t really blog when working on secret sauce. Fortunately, I’m no longer working on secret sauce – it’s time to get going again! I rewrote the link-management portion of libalby. The line-cutting algorithm deserves a post on its own (it's not complicated, but you can't describe it quickly) but the tl;dr is that it's cleaner and bug-free. 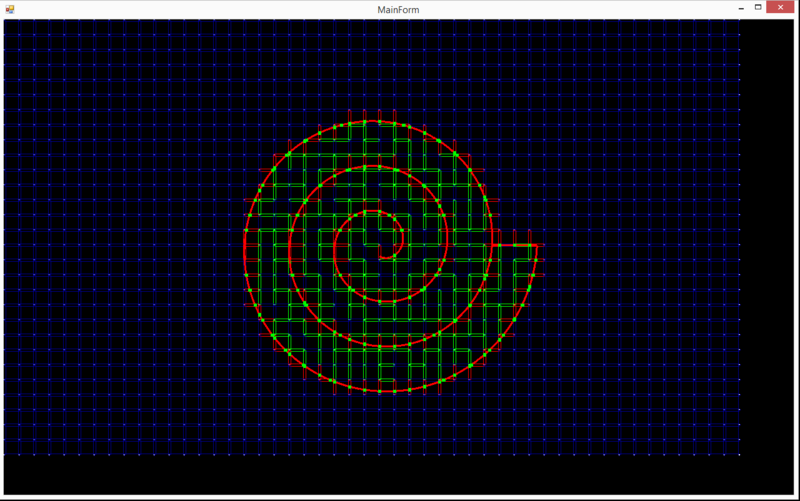 Oh yeah, and I rewrote the renderer - I'm no longer rendering maps to console! Red: Guides for dungeon generation. Lime: Connections between cells (rooms). 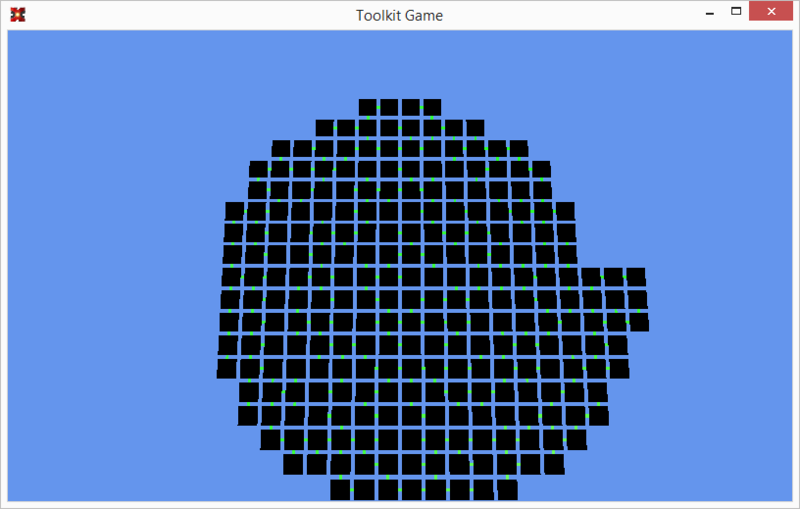 It didn't take too long to hack together a 3D render using SharpDX Toolkit - here we go! Black Cells - Rooms you'll be able to run into. Green Lines: Links between connected rooms. Copyright © 2014 Michael "Warty" Yu. All Rights Reserved.